Hierro, N.; Galanis, N.; Casany, M.J.; Mayol, E.; Alier, M.
There is a recent interest in the research of Lifelong Learning and other related kinds of learning (formal, non-formal and informal). Some projects have been held in order to propose frameworks for managing all these types of learning, giving special attention to the informal learning. The TRAILER project is one of them. It supports the identification and management of informal learning activities. It gathers informal learning activities with an Informal Learning Collector (ILC) and a Portfolio is used to make visible how much a learner acquires informal learning. The main way for registering informal learning activities data into the ILC is using push mechanisms where the users explicitly introduce such information. In this paper, we propose an alternative way to register information about informal learning activities, but using a pull mechanism, where the ILC collects data from external applications. In this sense, we improve ILC usability. There is a recent interest in the research of Lifelong Learning and other related kinds of learning (formal, non-formal and informal). Some projects have been held in order to propose frameworks for managing all these types of learning, giving special attention to the informal learning. The TRAILER project is one of them. It supports the identification and management of informal learning activities. It gathers informal learning activities with an Informal Learning Collector (ILC) and a Portfolio is used to make visible how much a learner acquires informal learning. The main way for registering informal learning activities data into the ILC is using push mechanisms where the users explicitly introduce such information. In this paper, we propose an alternative way to register information about informal learning activities, but using a pull mechanism, where the ILC collects data from external applications. In this sense, we improve ILC usability. Hierro, N. [et al.]. 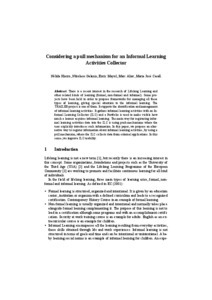 Considering a pull mechanism for an informal learning activities collector. A: Workshop on solutions that enhance informal learning recognition. "Proceedings of the International Workshop on solutions that Enhance Informal LEarning Recognition – WEILER 2013". Paphos: 2013, p. 31-38.